In 2004, after toiling for years behind the scenes as an in-house producer at Roc-A-Fella Records, Kanye West made his grand entrance on the world stage. 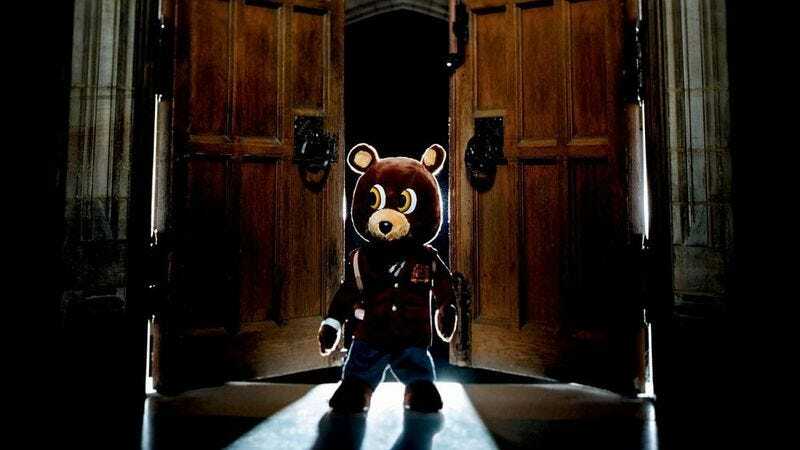 His debut album, The College Dropout, was buoyed by singles “Through The Wire,” “Slow Jamz,” and “Jesus Walks,” and it set a new tone and sound for all of hip-hop. A bar had been set—and then West obliterated it with his follow-up, Late Registration. The College Dropout had been an unmitigated success. It sold over 400,000 copies in its first week, eventually reaching triple-platinum certification, charted two top 10 singles—including “Slow Jamz,” which went to No. 1—and it scored 10 Grammy nominations, winning the Best Rap Album award. And in the face of such extreme success, West decided to go even bigger. Trying to match or exceed a blockbuster album does have some advantages. West was no longer just another face in the halls of Def Jam, he was a bona fide star, and was afforded a massive budget—reportedly $2 million—to bring the sounds in his head to life in their fullest form. This was his first chance to display one of the great hallmarks of his critically acclaimed career, the ability to abandon tried and true methods in favor of something entirely new—and he wouldn’t have to cut any corners to make that happen. One of the first songs that West and Brion worked on together, “Gold Digger,” was the record’s biggest success. An ode to women more interested in a man’s bank account than in his looks or personality, the song hit a major nerve with its tongue-in-cheek lyrics and infectious use of the Ray Charles classic “I Got A Woman.” As a kicker, West called up his old friend Jamie Foxx, who he’d already used on the song “Slow Jamz” from his first record, and who was then portraying the pianist in the film Ray. He asked Foxx to provide the track’s spoken intro. It was fun and it was funny, showing off a side of West that he’s seemed less willing to reveal as the years have worn on. Even with its moments of levity, West spends much of Late Registration looking outward and providing biting commentary on the world at large. Just like on The College Dropout and each one of his follow-ups, there are a number of deeply personal moments on Late Registration, like the tribute to his mother, “Hey Mama.” His overall vision expands even more on the song “We Major,” where he raps about the travails of the black experience in America, and especially the bonus track, “We Can Make it Better.” The latter features Rhymefest alongside the holy triumvirate of socially conscious rappers—Common, Talib Kweli, and Q-Tip—who trade verses about crime, poverty, and a system designed to look the other way. Speaking of “We Major,” it’s also worth mentioning that Nas’ inclusion on that track at least helped close the book on his years-long feud with West’s mentor Jay Z. When Late Registration finally dropped on August 30, 2005, after West had spent nearly a year in multiple studios around the U.S., it moved even more quickly than his first album, selling over 800,000 copies in the first week and claiming the top spot on the Billboard album charts. That year at the Grammys, West again grabbed the award for Best Rap Album while also taking home a pair of statues for Best Rap Song for “Diamonds From Sierra Leone” and Best Solo Rap Performance for “Gold Digger.” Robert Christgau, the so-called dean of American rock critics, would name it the second best album of the 2000s, and Rolling Stone placed it at 118 on its list of the 500 greatest albums of all time. Late Registration has the distinction of being West’s best pure rap album. That’s not to say that it’s the best work in his canon—that distinction belongs to My Beautiful Dark Twisted Fantasy—but it’s his greatest work as a rap artist. There’s no cranked Auto-Tune, and he leaves the singing to the guest artists like Brandy. This is West refining his style after finding his audience—but before he moved toward anthemic arena pop, before his mother died and he stripped everything down to its core, before he became exiled and offered up his magnum opus as a penance, before the anger at the fashion industry spurred him into his most aggressive stance, and before discovering the joys of being a family man. Late Registration is Kanye West attempting to be the greatest rapper in the world, and to live up to his own hype—and it mostly succeeds.